An honor for Pakistan and shame for Cricket Board. It is said that culture and sports has no borders and hence it is proven as well now. We do not respect and utilize talent of our nation but perhaps in this matter India has got edge. Not only they give acknowledgment to their talented people but also try to get benefits from neighboring country’s talent as well. 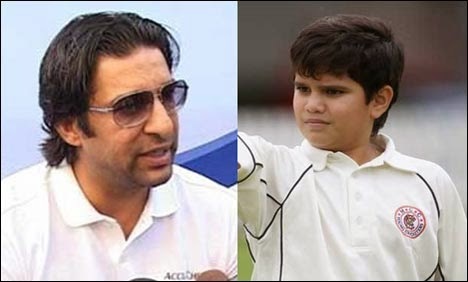 It was reported on national and Indian media that Pakistan’s former star and all-rounder Wasim Akram is giving bowling tips to Arjun Tendulkar, son of great Indian batsman Sachin Tendulkar. No doubt it is a big news. Sachin who is himself a legend trusts anyone but Waseem to train his son and chose him to become his mentor, and may be the junior Tendulkar will keep the legacy go on. The former Pakistan team’s captain gave the tips to 15-year old Tendulkar at Mumbai’s Wankhede stadium where the former Indian maestro was also present. “He’s young, he is keen and is a left arm medium pacer. I spoke to him about his action and swing. He is like a sponge, that’s a good thing,” Akram was quoted by Indian media as saying. Wasim Akram is the bowling coach of Shah Rukh Khan’s Kolkata Knight Riders in Indian Premier League as well. Once in a show Akram said that I cannot ask my board to choose me, it is their duty to realize who can be a better coach for their team, one who is from that soil or the one even whose language our players cannot understand. This is an honor for Akram and perhaps a shame for our cricket board who is unable to respect his talent and give him an opportunity to serve his national team as a mentor.